Lights Slots has a beautiful background, soothing Asian-style music and an overall mesmerizing feel. So sit back, relax and spin to win! There are FREE spins to be won and loads of fun to be had. 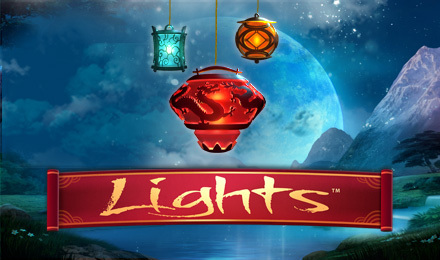 Lights is a 5 reel and 9 payline online video slot game with an enchanting firefly and lantern theme. The game has an Asian background, with beautiful images of the Himalayan Mountains and waterfalls. There are fireflies fluttering about. When they hover over a symbol after the reels have been spun, that symbol will become the Wild, or more specifically, the Floating Wild. The Yin Yang symbol is your Scatter, and will activate your FREE spins when 5 appear across the reels. Lights is the perfect slot game when you're looking to having a relaxing time online. You can sit back and enjoy the music as you spin to win!